Everyone knows Louisa May Alcott, the author of the much-beloved Little Women. Many readers know that the stories were loosely based on Alcott's life and family. But few people stop to think about the real lives of the other little women. 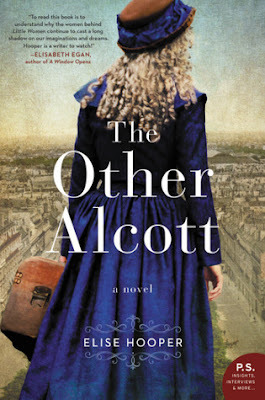 In The Other Alcott, Elise Hooper imagines the life of May Alcott, the woman who is known to many readers as tempestuous and selfish Amy. Both Louisa and May are women who love art--Louisa writes stories and May is enamored with drawing and painting. When Little Women is published, Louisa's story is praised and May's accompanying illustrations are panned. Their paths diverge, as Louisa takes up the mantle of providing for the family financially and May must care for their everyday needs, at the expense of her art. It will take a break from the family for May to develop her artistic talent and discover who she really is, away from the shadow of Amy March. Like many girls, Elise Hooper grew up loving the story and characters of Little Women. She even lived near the Alcott's family home. Hooper tells readers in the afterword that she started writing this book the day her youngest daughter started kindergarten, because May's story had been calling to her for years. It's easy to see Hooper's love for the Alcott family on these pages. They lived in the middle of a fascinating period in history--their father was a prominent abolitionist, Louisa was one of the few women of her time to have a successful career as an author, and May experienced an art world on the brink as new styles like Impressionism came to the forefront. But of course this must be a book about family at its core, since it is a fresh look at the little women. While the fictional March family made poverty look charming, that was not the reality for the Alcott family. Louisa worked incessantly to provide for the family and the friction in this story comes from two sisters trying to find room for both of them to have careers when there are bills that must be paid and a family that needs care. Hooper shows us a May who could be passionate like her fictional counterpart, but also cared deeply for her family. In this story, Louisa is a woman is cold in a way Jo never was, when her determination to keep the family solvent and have a successful career takes precedence over anyone's happiness. The Other Alcott is a must-read for anyone who counts themselves among the devoted fans of Little Women. It's also a story that shows that the tension between pursuing our dreams and caring for our families is an old, familiar tale. I loved the Little Women growing up and as a child I tried to write a "modern" version, but then my mom explained about plagiarism so I stopped. Now writers are doing their own twists on classics all the time. Looks like I should have kept is up! Looks like a fun book. I always loved LITTLE WOMEN and I'm so looking forward to learning more about these sisters! This sounds so good! I love books about authors and it seems like this one was a great story.